Exactly what you've been looking for! The Mascot II is a stylish, intelligently designed, combination boiler & water heater from Laars Heating Systems. Its 95% plus efficiency lowers operating costs and the "zero clearance installation" allows it to fit just about anywhere. Homeowners love the quiet, dependable, and energy saving operation of the Mascot II. 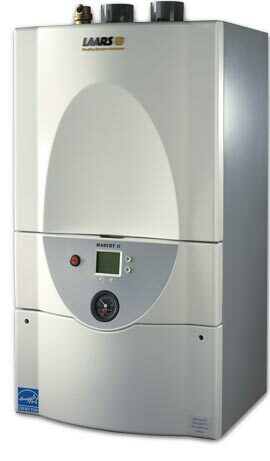 This wall-hung, compact powerhouse has ample output for both home heating and a continuous supply of domestic hot water. Contractors appreciate the Mascot II for its service-friendly design and fully packaged system components that allow faster install times compared to other units on the market. Included components can save contractors hundreds of dollars in material and labor costs and help to reduce installation errors. Copyright © 2015 Blue Sky Heating Inc.